If you’re looking for refreshing, stylistically bold historical fiction, look no further. 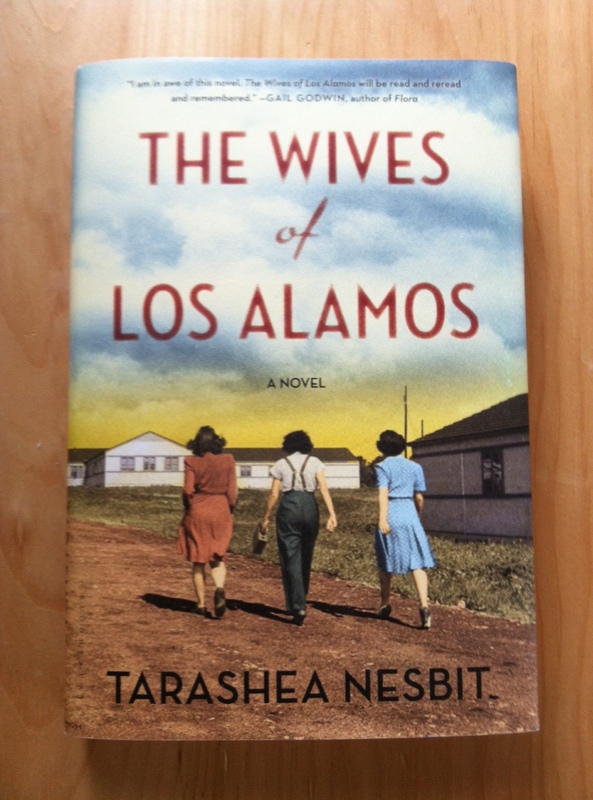 The Wives of Los Alamos*, TaraShea Nesbit’s debut novel, is the book for you. Written from the unconventional first-person plural perspective, The Wives of Los Alamos explores the difficult transition from the ordinary world to the extremely secretive world of the Los Alamos site of the Manhattan Project. Leaving behind their families, friends, and often careers of their own, the women married to the scientists who created the atomic bomb gradually form a community in the desert. At first the choice of the first-person plural threw me; I was expecting a standard interconnected-threads type of novel, following maybe three or four women through their time at Los Alamos. Instead, I found Ms. Nesbit’s approach simultaneously universal and intimate, emphasizing both the common struggle to adapt to new living conditions and the idiosyncrasies of particular women. At first, the women focus on the physical isolation and practical problems of life in New Mexico: no automatic washing machines or bathtubs, often inadequate supplies at the commissary — and the inability to visit with parents or even children old enough to attend college. And of course their husbands are sequestered in the labs, unable to discuss anything about their work. As time goes on, strain mounts as the wives negotiate the complex web of relationships they’ve developed — with each other, with their husbands, with the men guarding them, with the women hired to help them around the house, with their own children — and, finally, as they come to understand the awesome destructive force their husbands have constructed. In addition to the well-articulated historical detail, I loved the roundness of the portraiture in The Wives of Los Alamos. While attesting to the scenic grandeur of the surroundings and the occasional pleasures of solitude, Ms. Nesbit doesn’t sugarcoat the realities of the women’s isolated lives, or their own blindness when it comes to the lives of their maids, often women of color. The women’s reactions to the revelation of the atomic bomb are mixed in tone, and treated thoughtfully. There are no easy answers, no neat endings — but that’s part of what makes this such a fascinating novel. *My thanks to Bloomsbury for providing me with a review copy of this book in exchange for an honest review. This one sounded interesting to me. I got it on Netgalley but was looking at the wrong date, and it expired before I could download it. Live and learn. It was great. I’m sorry I’ve been horrible about commenting on your (and everyone else’s) blog this week — I have bronchitis and a sinus infection and I’m not on the computer much. I’ll catch up next week, though! Oh, I’m sorry. I was sick a few weeks ago, so I know what you mean! I’m still not back up to par. I read about this book just yesterday on another website. The story sounded intriguing then, but your review makes me think it’s definitely worth checking out. Thanks CJ! Excited for the end of PL? Yes, this sounded mildly interesting to me until I read your review. I’ll definitely put this on my TR list now. I was reading Bomb: The Race to Build–and Steal–the World’s Most Dangerous Weapon to my son (my first time to read about this story in general) and The Wives of Los Alamos should be a great complement! That sounds like a great NF title — did you both like it? As I told Kay, I’m really behind on others’ blogs this week because I’ve been really sick, but I’ve been seeing your posts in my email and I’ll catch up next week! It’s somewhere between a children’s to young adult book. We haven’t finished it yet because it was still a little difficult for my son when I last read it to him. So I set it aside but now might be a good time to pick it up again. It’s riveting, and quite sophisticated for a middle grade book I think! No worries about the blog reading. I’m so sorry to hear you’re still sick. I’ve been really dragging as well and feeling under the weather. Hope you get better soon! It honestly never occurred to me just how secretive they had to be — it must have been terrible. Sometimes if feels like reading nonfiction — the historical detail is that good. I have to agree with C.J. and Cecilia – I was mildly interested in this book before, but your review has made it sound even more appealing. And I love the picture on the cover! It reminds me of The Astronaut Wives Club (which I haven’t read), except better. You know, what it made me think of the most is the movie The Right Stuff, which balances all the test pilot/astronaut stuff with what life was like for the wives. How was The Astronaut Wives Club? I didn’t actually read The Astronaut Wives Club, just heard about it. No worries, by the way. I hope you’re feeling better! I totally adored this book, too. I had seen some of the reviews on Goodreads before reading it, so I was prepared for the plural narrative, but it still threw me a bit, too. Once I settled in, I fell in love and couldn’t believe how perfect it was. "charged and waiting": Audre Lorde's "Recreation"
"Arbolé, arbolé . . ."